168 pages, softback, over 250 colour and b & w illustrations including 5 patterns. 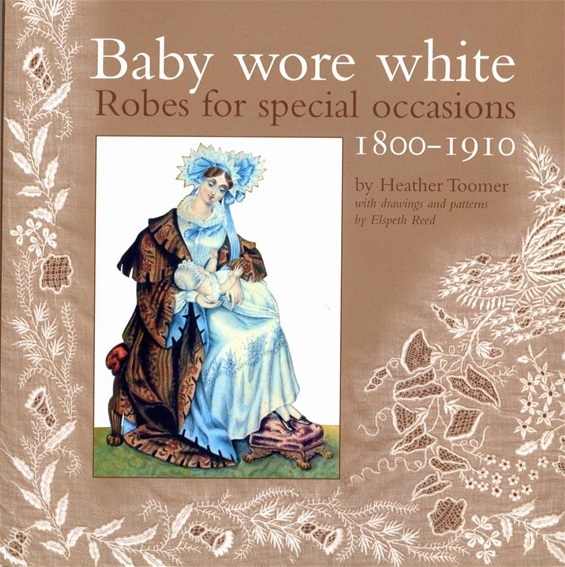 This fully illustrated book reviews the history of christening and other decorative baby robes through the 19th century. A first section uses dated examples and contemporary illustrations to show when different styles were in vogue and compares and contrasts them with adult fashions: a second section celebrates the exquisite workmanship in many of these robes with numerous photographs of more than forty garments. Tips are given on washing and conservation. Patterns are provided of four different styles to enable home dressmakers to make accurate reproductions. A list of dated garments in public collections and a glossary are included. Prices including postage: £17.50 within the United Kingdom; £22.75 within Europe; £26.50 to U.S.A. and Canada; £27 to Australia. Please email me on htac2000@gmail.com to ask me about postage charges to other countries or combined charges for several books.